This review has not yet been approved by the owner of this writing service. If you are the webmaster of Customessaywritingservices.org, please Contact Us to approve or remove this review. The website is so-so at the very best. Design is passable, but speaking about usability, most info that may come in handy is safely hidden among tons of poorly written filler text, and some pages don’t open at all. Prices are generally higher than average, especially for the low-complexity and low-urgency orders: they start at $17.95 per page and rise as high as $47.95. Price depends on how soon you need your order done as well as its academic level. Some additional features are available for additional fees. Phone, live chat, email. They are supposed to be available 24 hours a day, which is probably true – operators get back to you rather swiftly. However, they take time answering your questions and often use phrases obviously copy/pasted from their rulebook, even when they have only marginal relation to what you’ve been asking about. There are no samples of writing on the site; the only way to judge the service’s competence in this respect is its blog and content on its pages – and these aren’t very reassuring. Perhaps there are not too many glaring mistakes, but the texts themselves are shaky, with noticeably un-English syntax and composed of stilted, unnatural sentences. Certainly incompatible with the kind of prices charged by the service. Free unlimited revisions for 14 days after receiving the order. 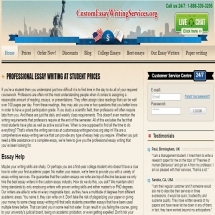 CustomEssayWritingServices.org is just yet another writing service, just like hundreds of others, without any distinctive features and notably bad or positive characteristics. Prices are somewhat higher than average, customer support is mediocre, writing (as far as one can judge by the site) is middling. Just like most others, it tries to rip you off by offering additional features that should otherwise be included in the price. In other words – there is little to say either for or against it.